Eisner winner Hicks (The Adventures of Superhero Girl, 2013) launches a new graphic fantasy series about two friends from opposite sides of a generations-long conflict. Over the years, many nations have invaded the City in order to control the only passage through the mountains to the ocean. Conquerors always give the City a new name, but like their victories, those names never last. Thirteen-year-old Kaidu is a son of the City’s current rulers, the Dao, and has just arrived in the City to begin his military training. However, Kaidu doesn’t get along with his Dao peers, perhaps because he’s more interested in books than fighting, and he instead befriends a girl named Rat, who is an orphan and city native. Their strong characterization and the vibrant Asian-influenced setting make this a satisfying series opener. Kaidu’s curiosity and Rat’s street-wise sass are immediately appealing, and the titular city is almost a protagonist in its own right, especially when Rat and Kaidu are freerunning across its rooftops. The warm palette, courtesy of colorist Bellaire, complements Hicks’ illustrations and highlights the diversity of the cast. 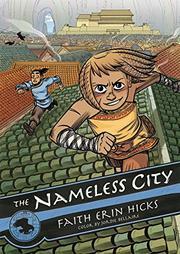 Offer this winning graphic novel to fans of Fullmetal Alchemist and Avatar: The Last Airbender, who will appreciate its mix of fun and adventure and its exploration of questions of identity, belonging, and history.